The Maple Ridge neighbourhood is in the Northwest corner of Regina and borders Rochdale Park to the South and the Lakewood neighborhood to the East. The development of this neighborhood was first approved back in 1985, and the area continues to expand with many new houses still being built in the North end of this neighborhood. Here is a link to the neighbourhood concept plan. About half the homes in the area are bungalows and almost all of those are over 1000 square feet. There are also quite a few 2-story homes in the area but very few other architectural styles are represented. At just over 1450 square feet, the average home size here is larger then many of the other neighbourhoods in Regina. This is a mature and quiet family neighborhood with 3 well enjoyed parks in the area featuring updated play structures and peaceful walking paths. 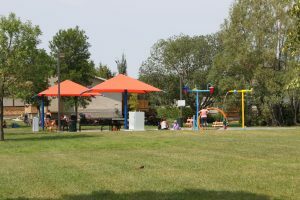 Maple Ridge Park A boasts a very popular outdoor spray pad where many of the locals gather for some wet Summer fun, and there is also a ball diamond located in the much larger Maple Ridge Park B. There is no commerccial development inside the neighbourhood, but not far away you’ll find nearby retail shopping and services, home decor centres, and restaurants. Looking for new schools for the kids? There are 2 new schools (Plainsview public elementary and St. Nicholas Catholic elementary) that opened their doors for the 2017/2018 school year. St. Angela Merici elementary school is also located in the Maple Ridge neighborhood.